We treat our dogs as part of the family, so it only makes sense to give them the proper nutrition they need to help them stay fit and healthy at all times. Ideally, you want to give your furry friend the best dog food you could ever get – one that’s nutritious, healthy, and contains fresh and natural ingredients. Fortunately, there’s plenty of them on the market. In this article, however, we’re going to review a number of products we’ve personally handpicked so you can give your pal all the doggy nutrition he deserves. Age is an important factor that can affect your decision when choosing dog food. After all, dogs require the right nutrition that can match their current stage. There are basically three: puppy, adult, and senior dogs. It’s important since your dog will require a certain amount of calorie and protein to achieve healthy growth. Therefore, to make sure you can provide your buddy’s growth requirements, determining his current life stage diet is important. 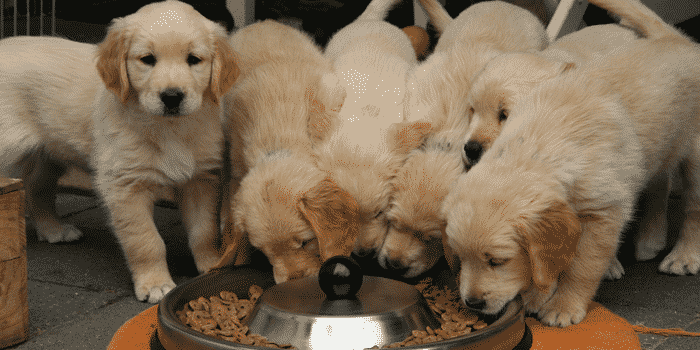 Compared to adult and senior dogs, puppies need a higher calorie content and more proteins to support their growth. Choosing the right puppy food for your little buddy can have an influence on his wellbeing and immune system. It is recommended to feed your puppy solid food within his first 3 to 8 weeks. You might also want to use an automatic dog feeder to make the process easier. Based on research, puppies need more protein, minerals, water, and amino acids so they can grow properly and develop better cognitive abilities. If there is some sort of deficiency, it may lead to growth impairment, even certain disorders. On the other hand, adult dogs will require less nutritional consumption since taking in too many calories and protein may lead to obesity. Dog foods that are designed for adult dogs contain nutrients which help support their overall growth and development. However, they mostly contain calcium, minerals, vitamins, fatty acids, and some proteins. Aside from a healthy diet, it’s also important to give your dog regular exercise. This is quite important since overfeeding can quickly lead to obesity which can further cause serious health conditions like heart diseases, diabetes, and more. During your dog’s senior stage, picking the right food can be tricky. This is due to the number of physiological changes he’ll go through during this particular stage. Senior dogs tend to experience arthritis, loss of hearing, urinary incontinence, and more. Therefore, you need to observe special nutritional care for your dogs. You want to pick dog foods that contain fewer calories and fatty acids but are rich in fiber which is important for reducing any problems related to their slow metabolism. You should also consider your dog’s breed and size when choosing dog food. There should be a balanced consumption of nutrients required for maintaining a healthy coat and skin, supporting growth and bone development, and developing a healthy immune system. Small dogs normally have faster metabolism compared to larger dogs. Therefore, you need to give them more fatty nutrients compared to the larger ones. If you have a small-breed dog, you need to provide him with more water and higher calorie intake. If done properly, this can easily translate in a stronger immune function along with a higher metabolic need upon reaching adulthood. You also don’t want your small-breed puppy to gain weight as it can lead to complications like arthritis and diabetes. Therefore, you need to pick a balanced meal consisting of fewer yet healthier ingredients. Meanwhile, if you have a medium-size dog, you won’t have a hard time meeting his needs. This is due to a medium-breed dog’s less aggressive metabolism. Of course, it’s still higher compared to that of large-breed dogs, so giving your dog a healthy supply of vitamins and minerals along with fatty acids and protein is important. You should also make sure that the food you give your medium-breed dog is nutrient-dense, mainly because they have smaller stomachs compared to larger dogs. Lastly, if you own a large-breed dog, you need to provide him with huge amounts of natural dog food to support his extensive nutritional needs. Since large dogs have a very active lifestyle, giving them nutrient-dense food is essential. You want to give your large-breed dog foods that contain vitamins, protein, carbs, fiber, and minerals. However, large dogs are more prone to complications like heart disease and diabetes compared to small and medium breeds. This often happens due to overnutrition which is a common problem among large-breed owners. To prevent that from happening, you have to moderate your large-breed dog’s intake. You should keep in mind that the ingredients in your dog’s food can impact not only his physical health but his behavior as well. Therefore, before you pick any product that says it’s dog food, you should check its ingredients first. When buying dog food, you should pick one that contains meat in its ingredients. After all, dogs are omnivores, and they shouldn’t be fed a vegetarian diet (unless under extreme conditions). Meat can also be in the form of a tissue from an animal’s internal organs – could either be from the esophagus, diaphragm, or heart. You should also make sure that meat is the first ingredient instead of a grain or vegetable. Although they’re not bad for your dog, they don’t offer that much nutritional value. A dog food’s expiration date is an essential factor you should consider. You should only buy dog food products that come with a date labeling or the packaging date printed on them. If you buy food with a short shelf-life, you should make sure that it can be consumed faster. Also, the faster your dog can finish it, the better. This way, he can get all the nutrients he can get without having to experience any gastrointestinal problems. Now that you know how to pick the best dog food for your furry friend, it’s time to read reviews of some of the best products on the market. There’s no denying that Wellness Core is one of the most popular brands when it comes to high-quality dog foods. This grain-free product is an excellent alimentation mix that contains turkey and chicken meat combined with vitamins and minerals. There are three different sizes to choose from, allowing you to pick the right amount of food to suit your dog’s current life stage. Additionally, it’s rich in antioxidants, vitamins, minerals, probiotics, calcium, phosphorus, and more. Perhaps one of its main selling points is its grain-free formulation. This means it contains ZERO grains for complete and balanced nutrition for your furry friend. Courtesy of Blue Wilderness, the Blue Buffalo dog food is designed for the more active adult dogs. It contains salmon meat which is ideal for dogs who prefer fishy flavors. It also has chicken meat as its secondary ingredient, making it an excellent choice if you want a unique combination of flavors. Since it’s a grain-free formulation, it’s safe for consumption for dogs who are allergic to grains. It has a 1% Omega-3 which is ideal for long-coated dogs. Aside from that, Omega-3 is known for its anti-inflammatory properties. Therefore, dogs with an itchy skin can benefit from this food’s soothing effect. Lastly, it has some glucosamine which is perfect for dogs who are prone to joint diseases. If you want a premium-quality dry food for your dog, then this product from Canidae will suit you best. As a grain-free product, it will work best for dogs that don’t have sensitive stomachs. One of the best parts about the Canidae dog food is that it’s made for dogs of all sizes and age. Therefore, you can give it to your puppy, adult, or even senior dogs. It’s available in nine grain-free formulas, each with different ingredients and flavors like chicken meal, lamb, turkey, and fish. Meanwhile, each of them is created with a limited number of ingredients to further lessen the chances of food allergies. If you’re looking for a one size fits all dog food product, this should definitely be included in your choices. 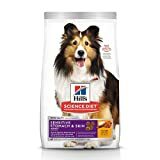 This dog food from Hill’s Science Diet is perfect for adult dogs who are suffering from skin and stomach sensitivity. It is made using the right balance of nutrients to keep your dog nourished and healthy without causing further complications. It’s made of a number of quality ingredients with the top 5 being brewers’ rice, chicken, whole grain sorghum, pea protein, and cracked pearled barley. Judging from the ingredients, you can say that it does contain a lot of grain, but it can also provide your dog with plenty of protein. It also contains a number of minor ingredients like soybean oil, pork fat, and dried beet pulp among others. If your dog isn’t allergic to chicken, then this food will certainly be beneficial. It also contains a LOT of grain which can be helpful for dogs with a sensitive stomach. Small-breed dogs have a really fast metabolism compared to medium and large dogs. Therefore, they need a higher concentration of calories for every pound of their weight. Fortunately, that can be achieved with the help of the Lil Plates recipe from Merrick. Basically, this recipe is intended for small-breed dogs like beagles or terriers. It’s not recommended for active dogs as it contains high amounts of fat and protein. Also, its high levels of omega fatty acids make it suitable for dogs with a long coat. The recipe also has a probiotic bacteria known as Bacillus coagulans which can help with digestive issues of small-breed dogs. They also prevent a number of conditions like ulcerative colitis and irritable bowel syndrome. The good thing about the Lil Plates recipe is that it’s made of high-quality ingredients including lamb, salmon, chicken, beef, and grain-free carbs such as sweet potato. If you’re someone who doesn’t shy away from corn, then the IAMS Proactive Health Adult Minichunks is the ideal food you can give your dog. It comes with real chicken as its first ingredient along with a few nutritious foods like fruits, vegetables, and grains. It also contains beet pulp, whole grain sorghum, carrots, spinach, tomatoes, chicken fat, dried eggs, and whole grain corn to provide your furry friend with a delicious meal to keep him healthy and happy all day long. Due to its balanced formula consisting of 14% fat and 25% protein, you can give it to your moderately active dogs without any problem. The IAMS recipe is enriched with L-Carnitine for additional fat-burning properties and an enhanced metabolism. It comes in tiny bite sizes which most dogs prefer. 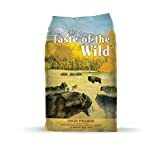 This grain-free high protein formula from Taste of the Wild is a premium dry dog food that’s available at a very affordable price. Since it’s grain-free, you don’t have to worry about introducing any allergies or unpleasant reactions to your furry friends. It has real buffalo as its first ingredient, and each serving contains 5% fiber, 10% moisture, 17% fat, and 28% protein. It also contains antioxidants and vitamins which are vital for maintaining a healthy skin and coat and for better digestion. Many dog owners claim that the Taste of the Wild dry dog food makes a good choice for their puppy due to the food’s kibble bites which are really easy to chew and digest. All in all, it’s an excellent dog food which is ideal for allergic dogs. As part of the Whole Earth Farms line of products from Merrick Pet Care company, this grain-free recipe is made using only wholesome and 100% natural ingredients. It has a premium animal protein as its first ingredient which is then followed by carbohydrates and fiber for maximum energy and easy digestion. The manufacturer has made sure that this dog food product can aid in your dog’s digestion and promote healthier skin. Also, they believe that adding fillers won’t add anything of value to the food. It is why it is only made using 100% grain-free and natural ingredients without any artificial flavors or preservatives at all. With its excellent balance of fats, carbohydrates, vitamins, proteins, and minerals, you can grow a healthy and happy pooch. This grain-free dog food from AvoDerm comes in a can and is designed for rotational feeding. It’s made of premium-grade ingredients that will help diversify your dog’s diet. This canned product has turkey as its first ingredient which is then followed by turkey broth and liver. Compared to the other dog food products on the market, this one contains fat derived from avocado oil and flaxseed which are considered extremely healthy. These healthy fats will help maintain the quality and health of your dog’s coat and skin as well as help them recover from red spots a lot easier. All in all, it’s a really balanced option that comes with fresh and healthy ingredients containing vitamins and minerals. It also has Omega 3 and 6 fatty acids for a healthier coat and skin. The PEAK dog food from Rachael Ray Nutrish is made of ingredients which can help improve your dog’s health and satisfy his instinctual cravings at the same time. It’s also a grain-free and gluten-free formula that contains no artificial flavors, colors, and preservatives. All three variants boast of high-quality ingredients that your dog will surely love. If you’re looking for one of the best dry dog foods when it comes to taste and ingredients, then the PEAK line might just be the one you need. 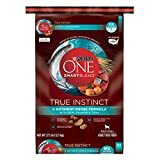 If you need an affordable dry dog food that contains high amounts of protein at a really affordable price, then this SmartBlend from Purina ONE is a solid choice. It’s made of real salmon and tuna along with an excellent blend of grains and healthy oils for an optimum nutrition for your furry friend. Along with other healthy and organic ingredients, it also contains healthy fats like Omega 3 and 6 fatty acids which are known to promote healthy skin and coat. Also, it contains corn gluten meal and soy which contain a lot of nutrients and can offer a number of health benefits to most dogs. However, they can cause a problem for dogs suffering from food allergies. Regardless, its healthy formulation and natural fish flavor are more than enough for your dog to enjoy. Q: How much food should I feed my dog? A: The amount of food you give to your dog will depend on his size, age, breed, and activity level. Puppies and younger dogs normally require more foods rich in fats and protein due to their rapid metabolism. Older dogs, on the other hand, only require fewer calories to keep themselves healthy. PetMD recommends this chart to serve as a guideline. Q: Should I go for dry or wet dog food? A: There are certain pros and cons for both dry and wet dog food. Basically, dry foods are more convenient since they can be left out for several hours without the risk of spoilage. They’re also easier to store and can serve as a temporary replacement for training dog treats. There are even dry foods which are meant to clean your dog’s teeth as he chews on them. Wet foods, on the other hand, provide a good water source if your dog is the type that barely drinks water. This also means that he can enjoy more meals without necessarily adding more calories to his diet. They also have richer flavors and scents, making them ideal for older dogs, especially those who have lost their keen sense of smell. Q: Can I give cat food to my dog and vice versa? A: It’s not a major problem as long as you don’t do it for every meal. Dogs and cats each have their own different nutritional needs, and dog foods are made specifically to meet a dog’s nutritional demands. There are also some differences between the two. For example, taurine is present in cat’s food while it can’t be found in any dog food. After all, taurine is produced naturally in a dog’s body while it’s not the case with cats. Q: Is it worth it to go for grain-free dog food? A: As long as your dog is perfectly healthy, then giving him a dog food with a few grains won’t cause any complications. However, if your dog has food allergies, you have to change his diet and go grain-free. Additionally, you have to always consult your veterinarian before changing your dog’s diet. Choosing what’s best for your dog will depend on your choice. As a dog owner, you’re the one who can monitor your dog most of the time. If he produces firm and healthy stools and is generally fit and active, then you shouldn’t have any worries. Hopefully, with the help of this buying guide, you can find the best dog product that will work for your furry friend. Also, don’t forget to consult your vet so you can get more information and advice.